Give your derriere the care it needs. Make sure you’re clean, confident, and comfortable every time you leave the bathroom. 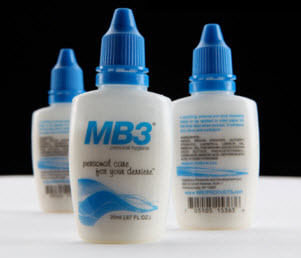 MB3 fits in your purse or your pocket. It’s the next best thing to taking a shower! No harsh chemicals, no formaldehydes, no parabens, no phtalates, no alkphenols, no fragrance, and no artificial coloring! Each bottle contains the potential for over 100 uses! Much more discreet than baby wipes — and no danger of clogging a septic system! 2.95 flat rate shipping, increase your savings!